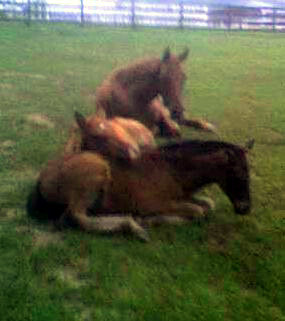 Three youngsters enjoying a group hug! We believe that horses are healthiest living the way they were meant to live. 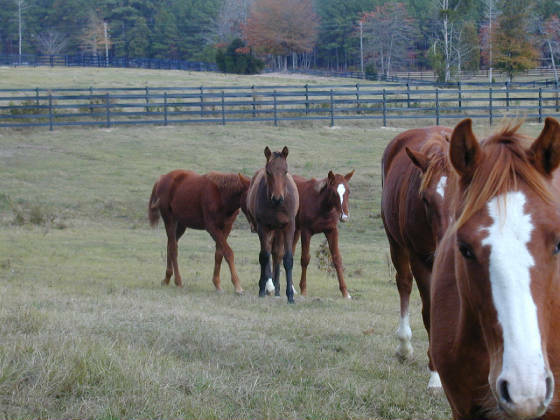 Our homebred horses live outside 24/7 in a herd environment, and are handled daily. This results in the much needed, but often missing , socialization that young horses so desperately need to live a "normal" equine life. It gives them the movement and fresh air needed to develop strong bones and a healthy immune system, free from the environmental polutants found in even the most immaculately kept barns. Our horses are kept on the natural trim, which encourages proper hoof mechanism, which, in turn helps the horse to remain healthy. 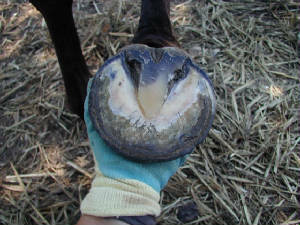 The hooves are meant to function as small pumps, increasing the efficiency of the circulatory system. When the circulatory system is healthy, so is the horse. The trim combined with the movement encouraged by the 24 hour turnout, helps to produce very healthy, sound, and correct youngsters!! Our feeding program is based on a "forage first" theory. 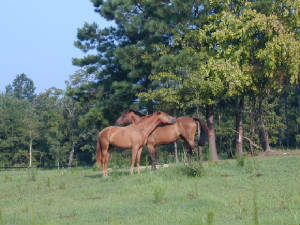 Horses are natural grazing animals, and ours have access 24/7 to pasture and/or hay. We feed low starch, high fat feeds. 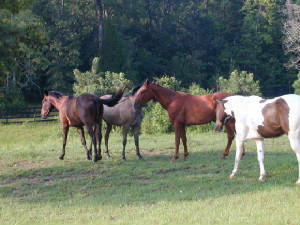 Horses have access to free choice grazing and hay is given as necessary during the winter and during the dryest part of the summer. 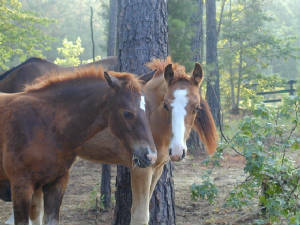 Our pastures are fertilized using organic products, which are safe to use around all animals at any time of the year.